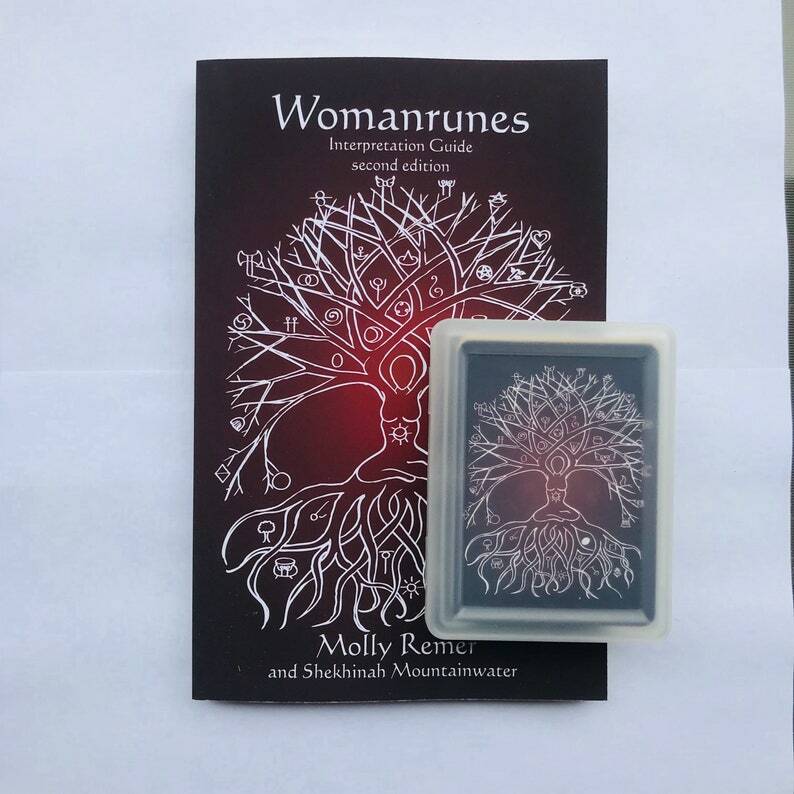 NOTE: this is this listing for the second edition of the Womanrunes book and card set. Second edition *books alone* may also be purchased via their individual listing in this shop or on Amazon. +new interpretation information and questions added for all 41 runes (book is now 207 pages long). In 1987, women's spirituality foremother and wayshower, Shekhinah Mountainwater, experienced a "goddess-lightning" strike of inspiration and created a set of 41 woman-identified rune symbols for divination and personal growth. Twenty-five years later, I discovered Womanrunes and created an expanded means of interpreting, using, and exploring these powerful, magical symbols. This listing includes the 207 page Womanrunes guidebook and a beautiful set of Womanrunes cards. The cards come in a clear plastic side-hinge box and include 41 rune symbol cards as well as a sample layout and some basic information on the cards and their use. You will also receive a bonus tree pendant gift as a thank you for purchasing directly from us! This system is perfect for use in Red Tents or women's circles. Red Tent facilitators suggest having a set available in a divination or inner guidance corner of the Red Tent for women to work with on their own or together. The final picture in the listing shows Womanrunes being used in the Red Tent in Lawrence, KS. A note for international customers. The postal service recently raised the postage rates and unfortunately it is a minimum of $13 to ship a package this heavy overseas. We know this seems very expensive, but it is literally how much it costs, there is no profit for us from the shipping fees. We do sell the card decks separately and the books are available individually from Amazon. This may reduce your shipping costs somewhat. We also have distributors in the UK (Moon Times), Canada (Calgary Red Tent), and Ireland (Womancraft Publishing) for customers in those countries. I absolutely love the deck and book. I really appreciate that the book font is big enough for me to read. I have been working with the book and deck for a few weeks since I received them and feel they are a great divination tool. I even did a reading for a friend and she said the messages she received totally connected to her and her question. As each of our items is handmade, we do not accept wholesale orders at this time. Depending on our current order volume, we will occasionally be able to offer a one-time small quantity discount for a women's circle, retreat, or event. We happily accept customization requests in terms of color and charm. We do not do custom sculpts or size alterations. Our usual shipping days are T, W, F, and S. We have a high order volume (thanks to all you awesome people!) and since our items are all handmade we often finish items as the orders are received. We strive to ship within 3 days of order date, but during busy seasons, it may be 5-7 days before your order ships, so please keep this in mind when placing orders. Orders are fulfilled both in order of date received AND in complexity (i.e. a small, simple order will ship much more quickly than an order of ten pieces). We are unable to promise delivery by a specific day, since after the item leaves our hands, it is up to the postal service when it actually arrives! If you need fast(er) shipping, make sure to choose Priority Mail at checkout.